We all have friends and family that are disorganized. If you see a mess, you know they are around. They are the pigpens of the craft world. 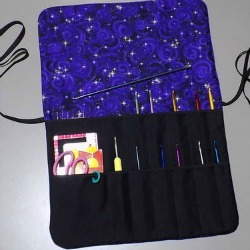 Help those people get organized with Pottermouth’s tutorial for a Crochet Hook Needle Roll. You don’t have to stick to just crochet needles. These rolls can hold paint brushes, markers, or embroidery supplies. They would also be a great gift for kids who travel. Roll up their favorite small toy, crayons and coloring pages. Don’t let this holiday season be a mess. Our Handmade Holiday Gift Guide will keep you straight with everyone on your gift giving list.